Jonathan Gold has eaten it all. Counter Intelligence collects over 200 of Gold's best restaurant discoveries--from inexpensive lunch counters you won't find on your own to the perfect undiscovered dish at a beaten-path establishment. He reveals the hidden kitchens where Los Angeles' ethnic communities feed their own, including the best of cuisine from Argentina, Armenia, Brazil, Burma, Canton, Colombia, Cuba, Guatemala, India, Indonesia, Iran, Italy, Japan, Korea, Mexico, the Middle East, Nicaragua, Pakistan, Peru, Thailand, Vietnam and more. Not to mention the perfectly prepared hamburger and Los Angeles' quintessential hot dog. Counter Intelligence is the richest and most complete guide to eating in Los Angeles. The listings include where to find it and how much you'll pay (in many cases, not very much) with appendices that cover food types and feeding by neighborhood. The first food critic to win the Pulitzer Prize, Jonathan Gold (1960-2018) wrote restaurant reviews for Los Angeles magazine, California magazine, the Los Angeles Times, and Gourmet magazine. 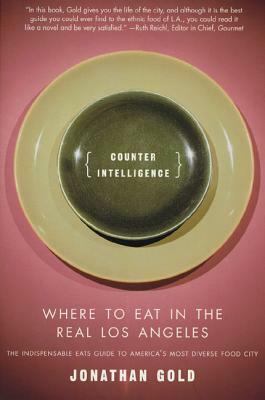 His book Counter Intelligence: Where to Eat in the Real Los Angeles collects critiques originally published in his long-running column for the L.A. Weekly. Gold was also the subject of the documentary, City of Gold.